well, putting a score over something like fatale while going through it with fps assumptions is definitely weird. But it could have been way worse and the last paragraph proved that the guy did get something out of it. I thought it was a very fair review, given the context. And we’re actually immensely pleased that a straight-up art piece like FATALE can get a score of 7. Of course, scores are hilariously irrelevant for art. But I find it very exciting that art can be compared to entertainment now. We really consider this a step forward in our ambition to bring art to the people (rather than trying to lure them into the museum). The problem is that Eurogamer dealt with Fatale in the exact same fashion that it deals with thousands of generic titles every year. A website that is unwilling to change its format when necessary – and such was the case – does speak volumes about the narrow-minded journalists that run it. The use of a score was only as hilarious as the approach to Fatale from a strict videogame player viewpoint. Albeit frustrating, I’ve lost count of the times I’ve seen this happen. Art… what do they know about art? Weren’t they the ones to describe Zeno Clash as a daliesque first person title some months ago? – and I still laugh everytime I remember it. Great publicity, of course. I hope it increases sales. Hm, it’s a good question, though. Should a games site change its format so they can deal with something that is not a game? Or should we be happy that they want to deal with it at all? Because even if Fatale is an art piece, I do think it is relevant to videogames. If only by adding to the diversity. Obviously, the rigid format of videogame reviews is incapable of dealing with this diversity. Other examples of games that are treated unfairly are children’s games, e.g., or the Nintendo games for Wii and DS. By not adapting to the growing diversity, the games press will ultimately end up in a narrow niche. Maybe that’s appropriate. But then (now?) we need other channels that can deal with the wide field that games have or will become. 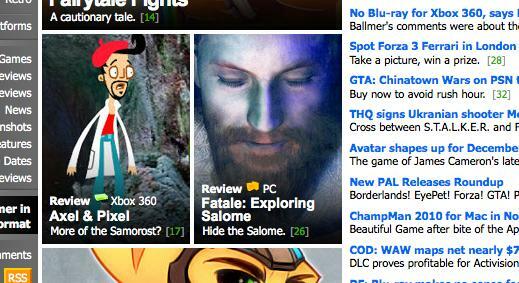 At this point, Eurogamer is catering to its audience. Its audience wants to know how good this or that product is as a game. Of course one could argue that journalists should try to educate their audience. And I feel that Mr Donlan tried to do that. In a language that may be alienating to art aficionado but that probably efficiently communicates to the gamer.